OUR CONTAINERS COME WITH A 36 MONTH WARRANTY. A regular height 20ft Container provides 1165 cu. ft. of interior volume. A regular height 40ft Container provides 2350 cu. ft. of interior volume. A 40ft High Cube Container provides 2694 cu. ft. of interior volume. A 45ft High Cube Container provides 3043 cu. ft. of interior volume. WANT MORE INFORMATION ABOUT CONTAINER SIZES AND CONDITIONS? REVIEW OUR HANDY GUIDE! WE CAN CUSTOMIZE YOUR CONTAINER! Container Yard can help you design and customize just about anything you can imagine! NEXT DAY DELIVERY IS AVAILABLE! We will help you organize and coordinate delivery to your Business or Home! Containers come in a variety of sizes and conditions. Learn more about both with our handy guide! 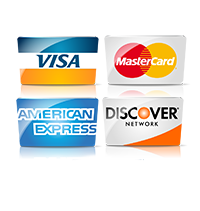 Don’t see your preferred method of payment, give us a call so we can accomodate you! WHY DON'T WE LIST PRICES? Shipping container availability fluctuates daily, containers are being sold, reused and constantly arriving at shipyards. Day to day pricing can change drastically, we may need to contact several suppliers in order to get you the very best deal on your desired container. Delivery destination also affects cost. We have a network of truck drivers nationwide, we need to coordinate with the closest, most cost effective driver to get the lowest and fastest delivered price. Let us know what type of container and container condition you want, along with your delivery zip code, and we will get you an unbeatable price. CUSTOMER SERVICE IS WHAT DRIVES US! UNPARALLELED CUSTOMER SERVICE AND SATISFACTION IS OUR PLEDGE.